Plans for Laura Street's next major project appear to be poised to take another step forward. Profit Investments Partners is seeking final design approval by the Downtown Development Review Board (DDRB) to convert 100 West Bay Street into a Hotel Indigo. 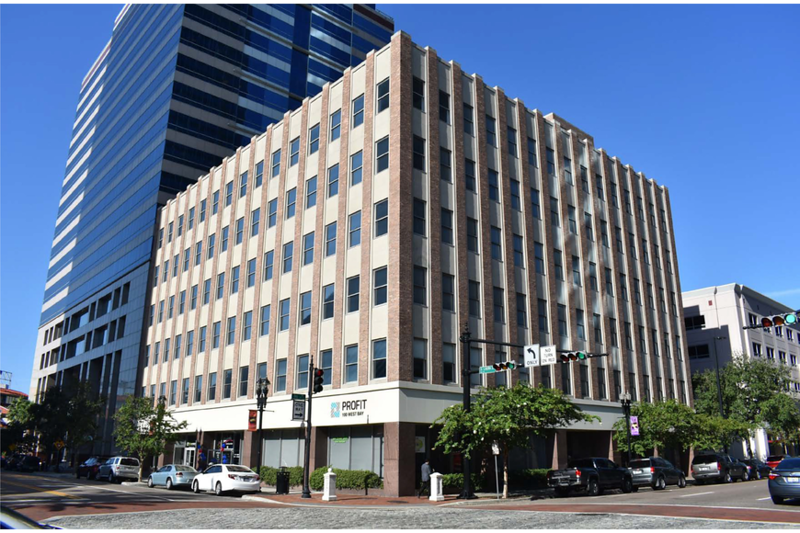 Located at the southwest Corner Bay Street and Laura Street, 100 West Bay Street is a seven story, 79,000 square foot building that once served as the headquarters of Stockton, Whatley, Davin & Company (SWD). Now Profit Investment Partners seeks DDRB final approval to repurpose the structure into a Hotel Indigo and rooftop restaurant and bar. Proposed plans indicate Profit intents to add a 95-seat restaurant and lounge along with additional retail space at street level along Laura Street, with the hotel’s lobby facing Bay Street. Floors two through six would contain 90 guest rooms along with a fitness center on the fourth floor. In addition, a 190-seat rooftop restaurant and bar would be included as a part of the project. The development team, which is in the final stages of completing the renovation of 20 West Adams Street into dormitory housing for FSCJ, does not intent to seek incentives for the project.